So, on a night when the offense actually shows some signs of life, the pitching completely falls apart. Brandon Workman was roughed up for three runs in the top of the first inning - he didn't even get an out until he was 25 pitches into the inning - as the Chicago Cubs erupted for a 16-9 win over the Red Sox at Fenway Park. The rout completed a sweep of the three-game series by the Cubs. Workman lasted just four innings, charged with six runs on five hits (including two home runs) and a pair of walks. Once the parade of relief pitchers started, it just got worse. Felix Doubront, Burke Badenhop, Edward Mujica, Craig Breslow, and Junichi Tazawa combined for a pitching line of 5IP, 10R, 14H, but on the bright side they didn't walk anyone! The Boston offense (finally) did its part with sixteen hits including three-hit games by Brock Holt and Dustin Pedroia. 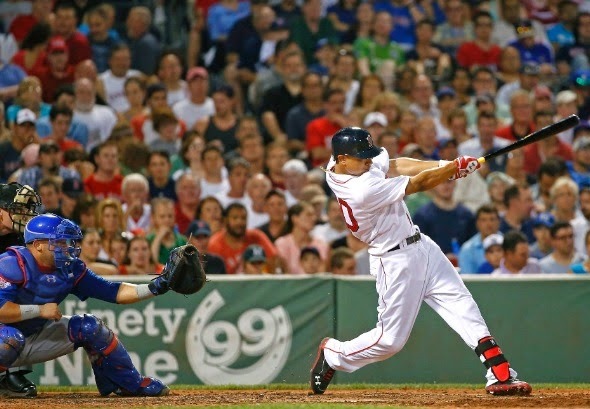 David Ortiz contributed a pair of doubles, and Mookie Betts (pictured) added his first career home run to the mix.